Have you ever heard of The Blog Baton? If not you're seriously missing out! The Blog Baton is an Instagram account (@theblogbaton) that was created by Mason from Mason...Like the Jar, and every weekday a different blogger hosts the Instagram account documenting their day. By holding the 'baton' you are able to show members of the blogging community your life and what you do during the day, in short it's an awesome way to reach new people and tell them about yourself and your blog! I hosted The Blog Baton this past Monday, September 29th. To say I was excited to hold the baton was an understatement! I had been dying for the day to come ever since I found out about it a month ago; I would see what other bloggers posted on the account and couldn't wait for it to be me! I even made a list of different things I wanted to share throughout the day so I wouldn't forget to document important pieces of my life that show off who I am. I thought it would be fun to recap today what I showed off when I hosted The Blog Baton! I think this will be a nice way to 'reintroduce' myself on here, and show you some of the things that I do during the day. Below the pictures I will include my comments I used for each one! "Good morning everyone! I'm Kristin and I blog over at Crumbs & Curls (crumbsandcurls.blogspot.com)! Mondays I don't start classes until later in the day so right now I am working on my blog post for the day and getting organized with my favorite planner!" "This is my blog that I love so much! I never knew how much blogging would change my life and what an amazing community the blog world is. I'm so happy that I started Crumbs & Curls one day on a whim, it's been an awesome journey so far! Stop by crumbsandcurls.blogspot.com and leave a comment so we can get to know each other! Today I'm talking about the fall accessory I'm dying to get: a plaid scarf!" "This is my Monday #OOTD! I'm trying to squeeze in wearing skirts while it's still warm enough out not to need tights!" "If you follow along on my Instagram then you may have seen this picture before! This is my dog Coco Chanel who lives with my parents when I'm at school, but she frequently visits me on campus! I took this shot a few weeks ago when she was visiting and we went on a walk!" "I'm a Senior Communications at Villanova University, which is located just outside Philadelphia. I wanted to go to the center of campus and take a picture to show everyone the how beautiful my school is, but it started to rain so I had to head back to my dorm. This is a picture on my walk back from class, which I will say is much prettier when the leaves change!" 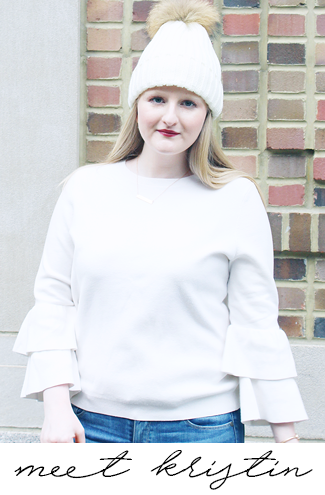 "One of my favorite parts of blogging is connecting with other bloggers! This is a letter that I got today from my blogger pen pal! I love getting snail mail, especially when it's from one of my favorite bloggers!" "I love to cook and tonight I made gluten free pasta with homemade (nut free!) pesto! You can find the recipe on crumbsandcurls.blogspot.com under 'Recipes', it's one of my very first posts so you will have to go back a bit. My trick is to make the pesto ahead of time and freeze it so I have it on hand when I'm craving it!" "This semester I'm taking a basic drawing course and I've been working on my project due tomorrow for a few hours now! It's not quite finished, but should be soon! I've never taken a class like this before in college, but I'm really enjoying it and love that I get to be creative!" "I'm a founding member of the Lambda Gamma Chapter of Alpha Gamma Delta! This is one of my sisters and I a few weeks ago at the Greekend football game! Joining a sorority is one of the best decisions I've made and I have gained the most wonderful friendships through it. Any other Alpha Gams out there?!" "Well my time has come to sign off for the day! I still have some work to do before hitting bed and right now I'm working on my blog post for tomorrow. I've had a great time hosting here today! Thank you to everyone who followed along and a huge thanks to @masonlikethejar for this opportunity! Make sure to check out crumbsandcurls.blogspot.com and follow me on Instagram at @crumbsandcurls! Have a great night!" I had such an amazing time hosting The Blog Baton and I recommend everyone check it out! I loved the amazing response that I got and I really felt like I reached new people which was wonderful. Mason is literally a genius for coming up with this and I am so thankful to her for letting me host for the day! If you liked what you saw here check out my Instagram @crumbsandcurls, and please let me know that you're stopping by from the blog! Today I'm linking up with What You Wish Wednesday, Random Wednesday, Mid Week Muse and Wordless Wednesday. Great re-introduction post, especially since I now learned that you're a student at my alma mater! Go Nova!!! I loved your feature on the Blog Baton, it is such a near idea and your posts were adorable! What a great idea! I love seeing glimpses into other blogger’s day to day live.